We are open every Wed and Sat from 12 p.m. until 4:00 p.m. and for scheduled events. 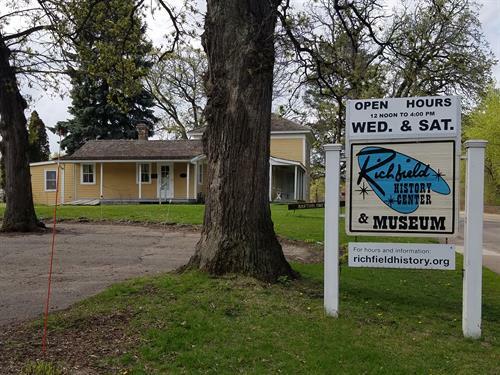 The Richfield Historical Society’s mission is: to acquire, document and preserve the unique story of Richfield, Minnesota. In addition, our mission is to inspire a sense of place and history through the details of our past. The Richfield Historical Society was formed in 1967 to preserve and share the history of the Bartholomew House. The House Museums stands as reminder of an agricultural age in Richfield before large farmsteads gave way to tracks of suburban homes. Built by Riley Bartholomew for his family in 1852, the house is now a museum giving visitors a chance to learn about farm life in Richfield. Thirty-eight years later, in 2005, the Richelieu History Center was built as a new resource for citizens and visitors of Richfield to discover the interesting history of Richfield. At the History Center you can tour the Bartholomew House, see exhibits and documentaries, attend events, or research history in our reading room. Our tours, exhibits, and most of our events are free to the public so that everyone in Richfield feels welcome at their historical society. Stop by some time!